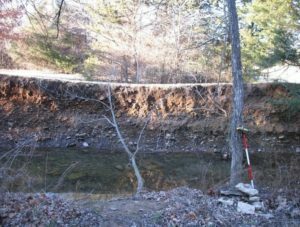 The Watershed Conservation Resource Center (WCRC) partnered with the City of Fayetteville (City), the Arkansas Natural Resources Commission (ANRC), and US Environmental Protection Agency Region 6 (EPA) to restore a section of an Niokaska Creek that flows through Gulley Park. The stream restoration demonstration project, located in the Illinois River watershed, was funded with an EPA 319 grant, which is administered by ANRC. The City provided the required matching funds for the grant. The project was initiated in 2006 and was completed December 2008. The demonstration project addresses the effects of upstream land use changes that have impacted the stability of the channel over the years. Increased numbers of roads and rooftops from urbanization in the watershed changed the way that stormwater runs off of the landscape resulting in higher and more frequent flows in the stream channel. 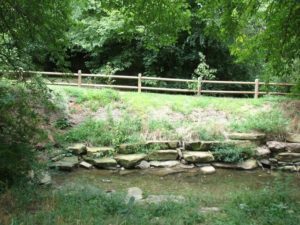 The restored section of the Mud Creek tributary was incised (cut into or carved out) and previously had several vertical cut-banks, ranging in height from six to eight feet, eroding into the park land. These banks contributed excessive sediment to the stream and had the potential to destroy walking trails and undermine wastewater utility lines. Rather than using traditional approaches, such as rip-rap, to stabilize banks, the WCRC designed a natural channel that reduced sediment from the banks, stabilized the banks, and enhanced the aquatic habitat for a 1,200 foot section of the stream that starts 200 feet downstream of the bridge on Township Road. The restoration design was built August 2008 by Elk River Construction. After construction at Gulley Park. The walking trail is protected from bank erosion. AFTER construction with vegetation established bankfull benches (small floodplains) within the larger channel, rock structures that deflect flow away from banks, and defined riffles and pools were constructed. Also, four access points were created by constructing step features from native stones. The WCRC built soil mattresses throughout the site and hand planted over 4,000 grasses, shrubs, and trees native to the restoration site during and following construction. A final planting of an additional 500 native plants was conducted, involving assistance from local volunteers. Several field tours have been held for developers and city planners to have the opportunity to see alternative approaches to addressing accelerated bank erosion within urban areas. The WCRC continues to monitor and maintain the project to evaluate effectiveness and ensure the longevity of the restoration project. By utilizing a natural channel design approach, project objectives of improving water quality and eliminating potential safety concerns were achieved while the beauty and biological function of the stream was maximized. By employing the natural channel restoration approach, the quality of our natural and water resources within the urban environment are improved for the enjoyment of the public who call Northwest Arkansas their home.